Garland Glass Company has the best talent and tools to help you with any windshield replacement you might have. Our certified repair specialists are adept at repairing any automotive window. From a chip to a nick no crack is too long for our repairman. Furthermore, we can replace your windshield quickly with professional service. 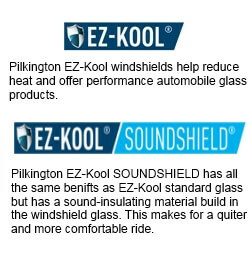 In fact, you will be hard pressed to tell the difference between your original windshield and the one that we install. Our technicians are highly adept at repairing auto glass and can restore the integrity of the glass. Our method will prevent the damage from spreading as well as making it less noticeable. A lot of people who broke their windshield neglect to have it repaired in a timely manner. Never realizing the hazard they are putting themselves or their family or friends in, not to mention other people on the road. Your automotive windshield is a lot more than just a large window. It is a sandwich of three layers – two layers of tempered glass with a layer of PVB (Poly Vinyl Butry) between them. Windscreens are specially made to endure punishment and can stand against most small low-velocity objects that the road can throw at them. Your windshield also helps to support the entire structure of your vehicle and in the event that a vehicle tips over in an accident, it also prevents its roof from collapsing. A windshield is specially designed to ensure that a person does not get ejected out of the vehicle in the event of a collision. When should you change your vehicle’s windshield and when will just a simple repair job do? While windscreen damages to an auto glass in Garland, TX are usually small and can be easily repaired, should it be larger than the size of a quarter it will need to be replaced. Also, if the damage is squarely in the driver’s line of sight then you’re going to need Garland windshield replacement. The simple fact is rock chip repair can leave distortions in the window which can hinder the driver’s sight. If your vehicle’s windscreen has suffered severe damage then we can send a technician to your location. Our mobile service is fully equipped to replace your auto glass quickly and properly. Please fill out the form below so we can get your auto glass replacement quote to you asap. Immediate service on Garland windshield replacement is best served by phone. Same day service always welcomes if spots are available.